If there is one state in India that offers the most to adventure-seekers, it’s probably Uttarakhand. Nicknamed the ‘Abode of the Gods’ for its sheer natural beauty, this state attracts travellers and trekking enthusiasts all year round. For those looking for a little mountain air, there are plenty of thrilling things to do in Uttarakhand. How about a whitewater rafting session on the Ganges? Fed by snowmelt from the mountains around, the Ganges gushes through Rishikesh, swirling around corners and forming multiple confluences. 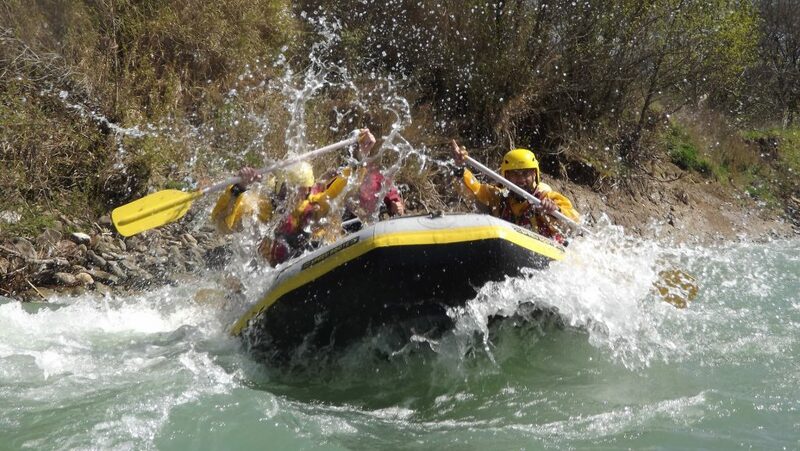 Some of the best rafting in India takes place here, and it is one of the most popular things to do in Uttarakhand. You can choose from a 16-35 kms stretch of river, and will battle rapids such as Return to Sender, Roller Coaster, Three Blind Mice, Double Trouble, Tee Off and Golf Course with difficulty grades ranging from I to IV. 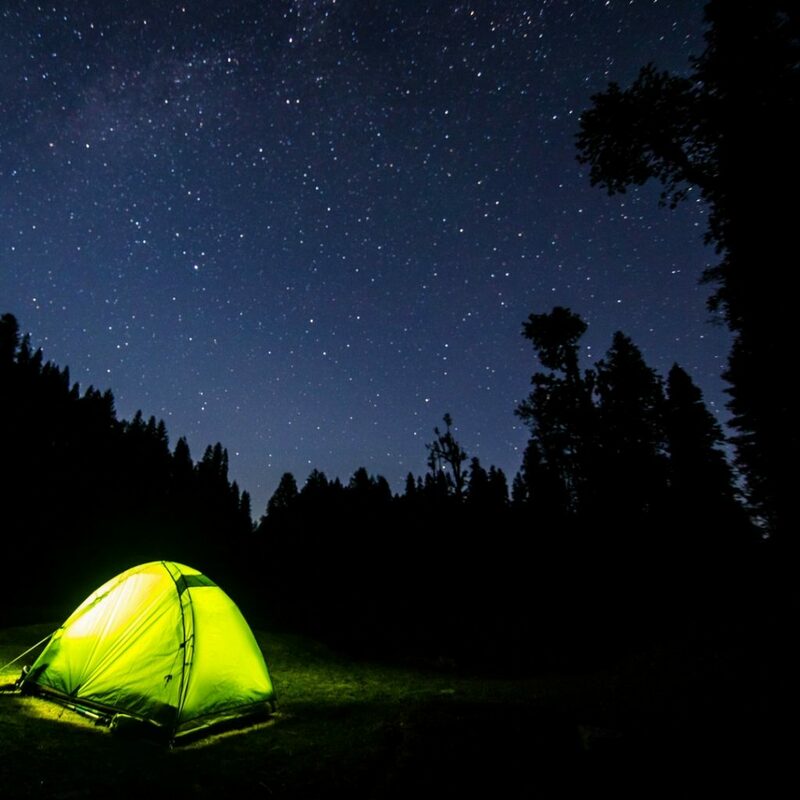 Camping is one of the best things to do in Uttarakhand if you want to experience the pristine beauty of the state. You can choose to stay at riverside camps in Rishikesh, enjoying the proximity to the city and the many cafes, temples, and adventure activities there. The camps provide accommodation, food and some adventure activities like hiking, fishing, nature walks, and rafting. Many campsites offer cottages or tents with air-coolers and air-conditioning, which is quite welcome in the hotter summer months. However, if you’re looking for a wilder experience, head deeper into the wild for a close-to-nature camping experience. 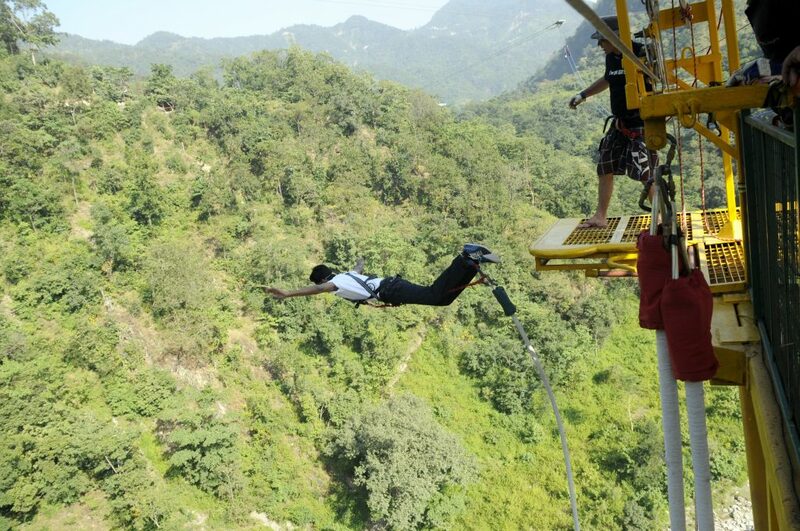 Bunjee jumping is the fastest growing adventure sport in India, and the best place to experience it is Rishikesh. India’s highest fixed platform for bungee jumping is located here, and offers you a thrilling jump from 270 feet. A couple of other fun things to do in Uttarakhand is the Giant Swing or Asia’s longest Flying Fox. Roopkund is a glacial lake nestled in the Garhwal Himalayas. Situated at an altitude of 16,500 feet, the lake is completely uninhabited, desolate and is surrounded by snow-clad mountains. The lake offers you a rare chance to see the ancient remains of human skeletons that surround it. It is a moderately challenging trek in Himalayas, and is not recommended for beginners. The best season to visit is in summer from May-June and then September-October. The Nagtibba trek starts at an elevation of 3500 feet and goes up to the top at 10,000 feet. It is a popular trek, as it is open most of the year, and because the short duration is perfect for newbies. You’ll hike up a hill, and will camp at the top, amidst wild mint and soft mountain grass, with magnificent views all around. The next day, you’ll head down to the base and go home. Dayara Bugyal is one of the most scenic treks in Uttarakhand, taking you up to some of the most gorgeous meadows in Uttarakhand. It goes up to over 11,000 feet, where you’ll be camping in high-altitude meadows, with misty mountain peaks all around. This easy trek is recommended for everyone i.e families with children, nature lovers and adventurers alike. 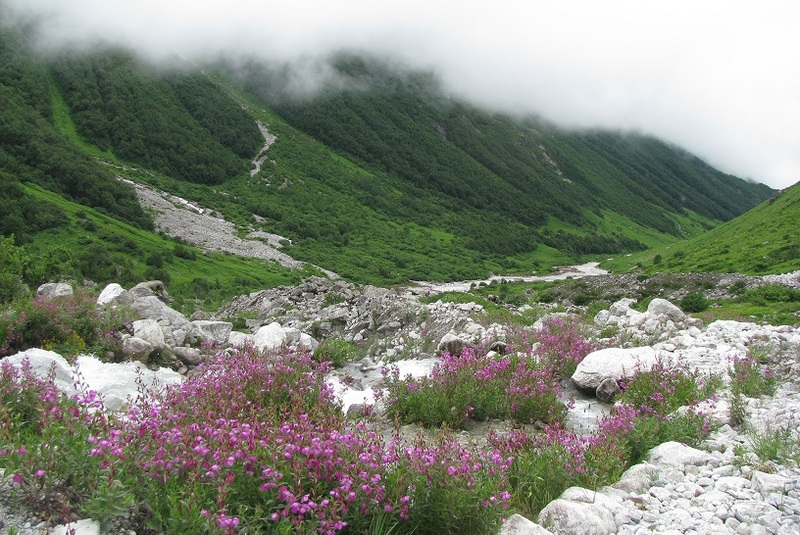 The gorgeous Valley of Flowers is one of the best loved treks in India. This easy trek takes you through the Nanda Devi National Park, a world heritage site that is home to over 300 species of wildflowers. Once a year, between June-Aug, the flowers bloom for a short window of time, carpeting the valley in a riot of colours. During this time, botanists, nature buffs and trekkers looking for an easy trek come here to take in the beauty. 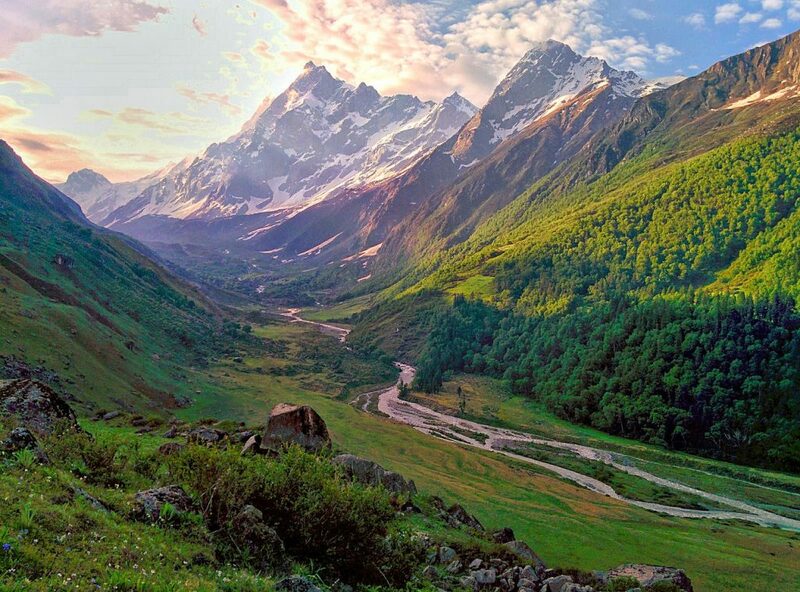 Har ki Dun, which translates to the Valley of Gods, is one of the least explored treks in the Himalayas. The trek to Har ki Dun valley is mix of peaceful walks and adventurous ascents. This is not a difficult trek, nor are the gradients steep, but there are long hours of walking each day, so do be prepared for that. The best time to visit is mid-May to June and then September to October. The beautiful Chopta-Chandrashila-Deoriatal-Tungnath circuit is a popular trek in Uttarakhand. 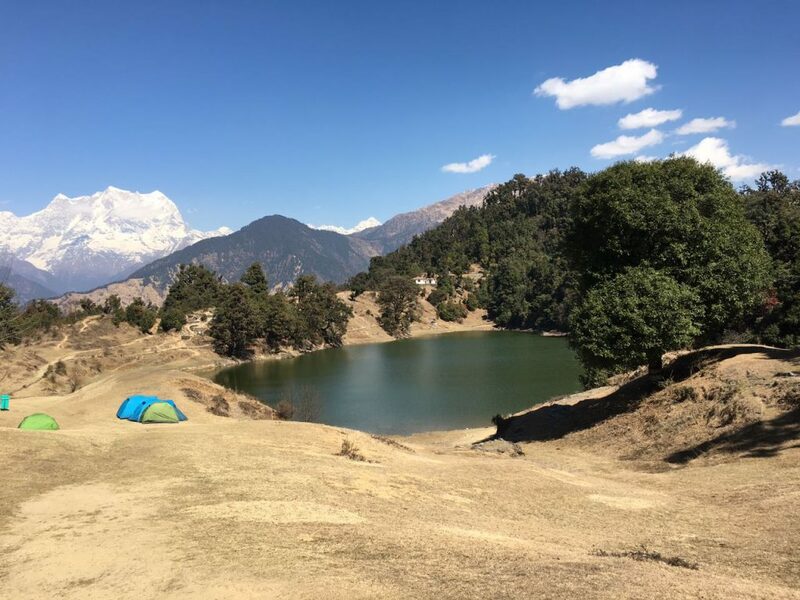 Climbing to Chopta and Deoriatal is not difficult, and is a popular choice for families with children, or for first-time trekkers. You’ll climb to about 8700 feet and will visit Deoriatal lake, a stunning blue-green lake with a serene vibe. Climb on from here to Tungnath, the highest Shiva temple in the world. 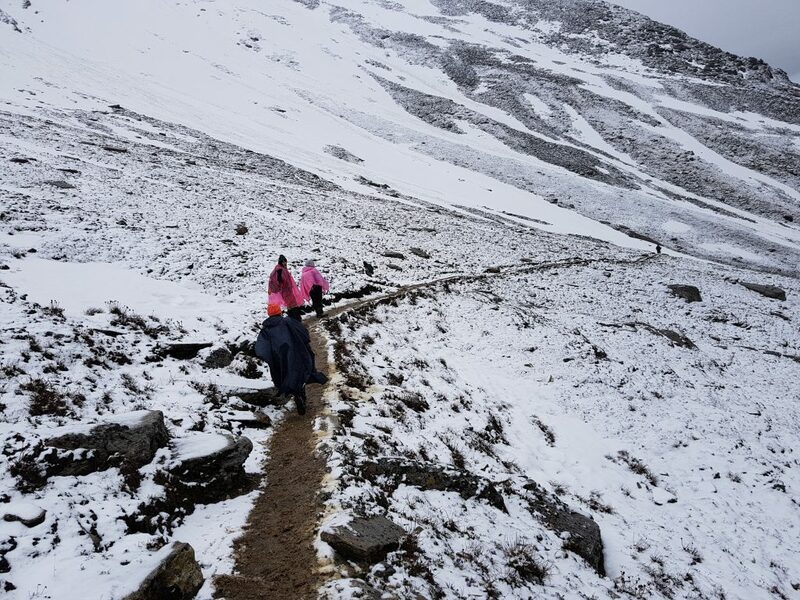 After this, the trek continues to Chandrashila peak, but it gets tougher from here, and is suitable for fit beginners or experienced trekkers. Chandrashila peak is at a height of 13,123 feet and gives you 360-degree views of the mighty Himalayas. Kedarkantha is a beautiful ridge peak, with an elevation of 12,500 feet. It remains accessible throughout the year, even in the heaviest snow days in winter. In a few short hours of trekking, you’ll be in the midst of beautiful mountains, away from the crowds. 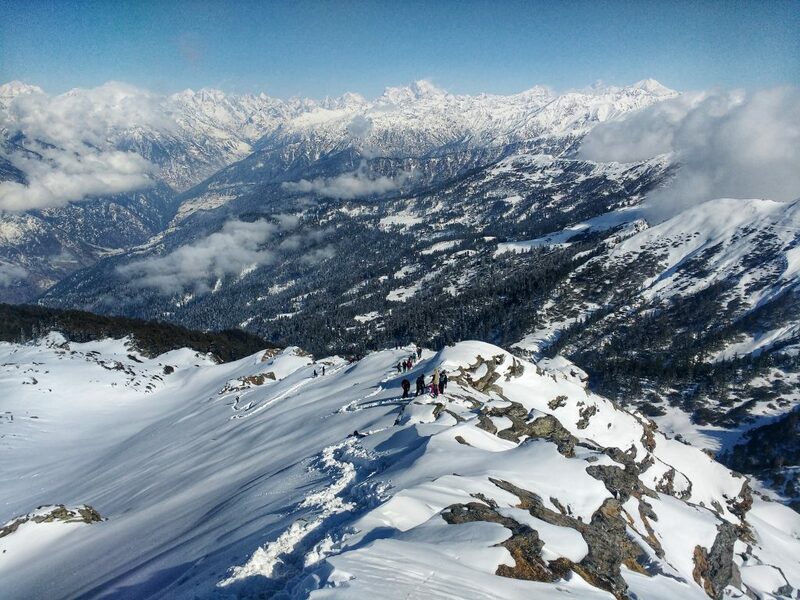 All these reasons make Kedarkantha a popular trekking route for adventurers, especially those who want to try a snow trek. The best time to visit is between December and March, when snow covers the land in a thick, pure white blanket, turning it from beautiful to spectacular. 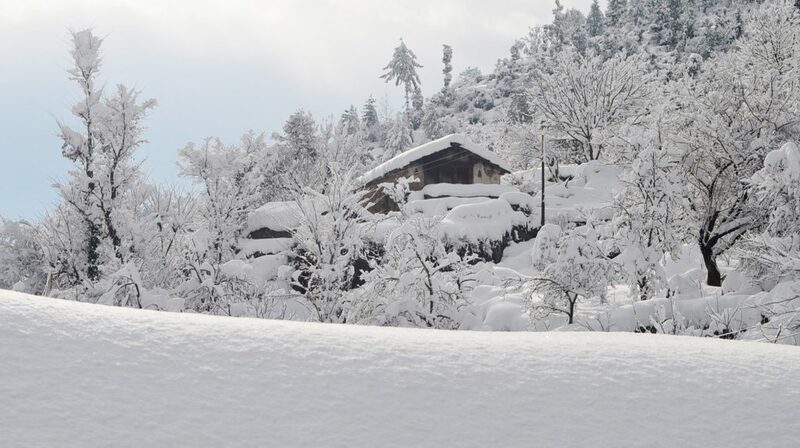 If you visit in the winter, one of the top things to do in Uttarakhand is to stay in this cosy ski lodge, tucked away on the snowy slopes of Auli. At this lodge, you’ll wake up every morning to a landscape blanketed in snow, the pine branches weighed down with the weight of snow on them. You can spend all day exploring the apple orchards and the local villages, taking a cable car ride, or you can head to the slopes to test your skiing skills. In the evenings, you’ll return to your cosy lodge for a pleasant evening spent reading, playing board games, or sitting around a bonfire and telling stories. You’ll be sleeping in mountain-view facing rooms, with queen sized beds, en suite washrooms, and a private balcony with a spectacular view. In the gorgeous state of Uttarakhand, there are lofty mountains, alpine meadows, frozen waterfalls, glaciers, and mysterious lakes – all waiting to be explored. 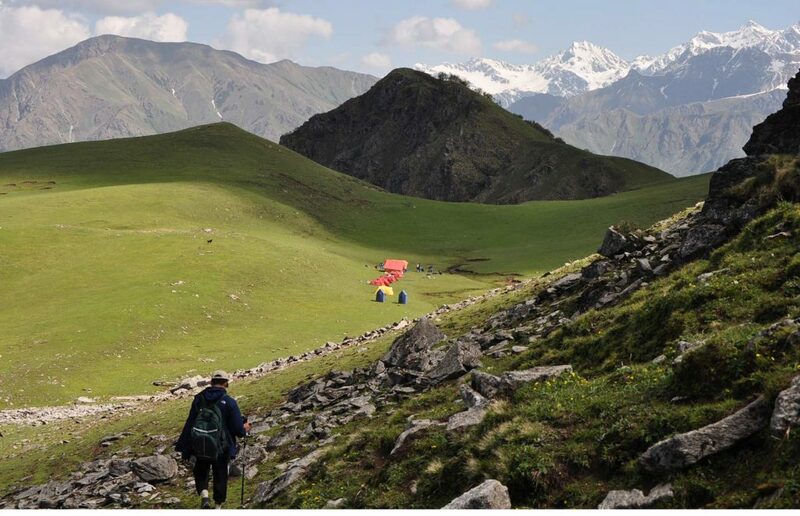 Any trek here will take you into the midst of this rugged terrain, meeting friendly locals from remote villages and nomad shepherds grazing their flocks.